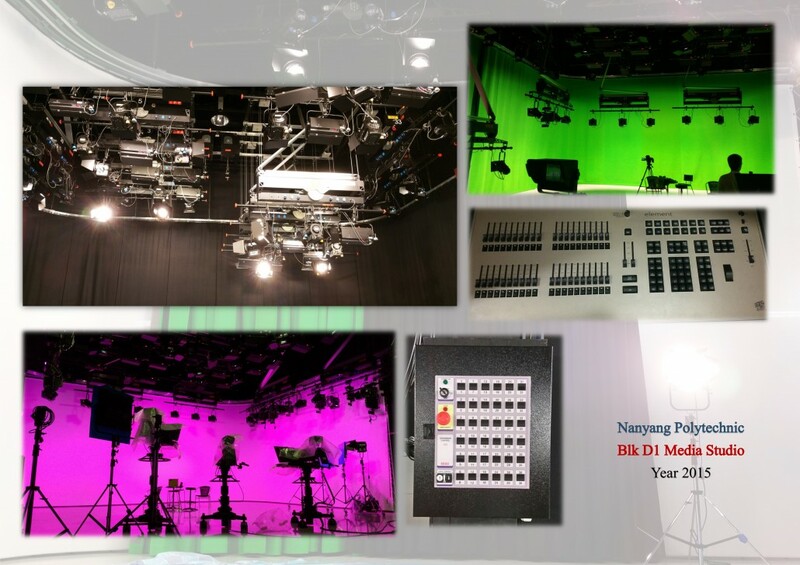 AVLite has successfully implemented a Turnkey studio lighting solution for the new Media Studio located at Blk D1 of Nanyang Polytechnic, School of Business Management. This studio has further equipped their students with even more opportunities to broaden their production skills! We have supplied and installed a total of 37 IFF motorised self-climbing hoists including production hoists, backlight hoists, cyclorama and scenery hoists. All hoists are wired to a centralised hoist control panel complete with a wired remote control. The studio was also designed and installed with FULL LED lightings eliminating the needs of any dimmer rack, at the same time conserving energy! We had also supplied and installed 67 LED lighting fixtures; consisted of Quartzcolor X series Fresnel spotlights, LED panel and ETC Lustr 2 series cyclorama lights. These are fully controllable thru the ETC lighting console located in the control room. As part of the Turnkey solution, we have installed a seamless cyclorama canvas, 2 pieces of foam-backed chromakey green curtain and a black wool serge curtain for different variety of backdrop effects. With the above in place, the users can fully utilize these facilities to produce varies type of projects!